Sony today announced a powerful addition to its audio line-up, with a host of the new products dedicated to delivering deep bass. 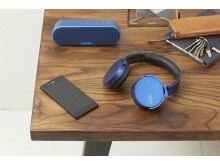 Expanding the existing EXTRA BASS series of headphones for when you’re on the move and bringing club sounds into your home, dance music lovers can now enjoy the intensity of deep bass notes in a variety of locations using the one box high power audio system or portable wireless speakers. One box, boombastic bass. With fabulous sound, bags of power and massive low frequency response from two large 16cm woofers, the XB7 turns nights at home into a premium clubbing experience. Sony’s unique EXTRA BASS technology uses DSP technology that cleverly processes frequencies according to the source while maintaining excellent audio quality. Music sounds and feels even more powerful, with punchy and deep bass notes that define today’s pulsing electronic dance tracks. Play things your way: Multi Layout lets you position the XB7 vertically or on its side, enjoying sensational stereo sound in either orientation. There’s also a handy Speaker Add function, allowing you to hook up a second XB7 unit via Bluetooth and instantly double your music power. Stunning sound, no wires: One-touch listening lets you stream your favourite tracks and playlists via Bluetooth with a single touch of your NFC smartphone or tablet. 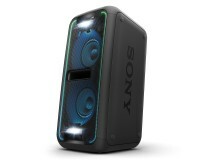 And if you want to get even more hands on, add cool DJ-style effects controlled with Sony’s SongPal app on your mobile. You can charge your phone or tablet’s battery over USB while you’re playing music. There’s also an audio input for connecting MP3 players or just about any other sound source. Impress your friends when you’re out and about with the SRS-XB3 and SRS-XB2 portable wireless speakers with dedicated EXTRA BASS button to pump up the party. 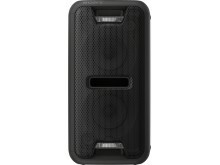 A whole host of big technologies are housed inside the XB3 to achieve a hugely punchy bass for its small size. These include a newly developed 48mm large full range speaker unit, Sony’s unique DSP which dynamically applies the optimal compression process to suit each level of a track, a large capacity battery to achieve stable and significant output power and dual passive radiators to augment the bass ranges. 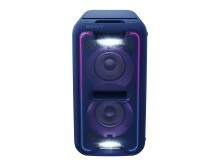 Weighing just 930gms, small enough to carry around and with a battery life of 24 hours[i] of continuous wireless use, you can party from dusk till dawn. The smaller SRS-XB2’s powerful sound belies the eyes; its palm-sized design weighs just 480gms but encompasses a newly developed 42mm gauge full range speaker unit. Its extra strong magnets deliver a pure bass sound and the lightweight diaphragm improves sound pressure levels. The XB2 also houses Sony’s DSP signal processing technology and passive radiator which all help to achieve high acoustic pressure and punchy bass notes that deliver more than the eye would believe. A four hours recharge of the battery provides around 12 hours of continuous wireless use, so you don’t have to worry about running out of tunes. 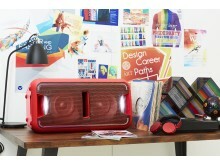 Both wireless speakers have multiple usage options. 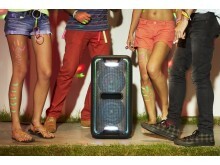 The XB3 is a party chameleon; use it horizontally or vertically depending on your own style or space limitations. Both the XB2 and XB3 enable you to wirelessly add two speakers together using the ’Speaker Add’ function[ii] for even more powerful sound; Double mode will play music back through two speakers simultaneously and Stereo mode will play the music in stereo. And don’t worry about spillages if your pool party is pumping as they’re water resistant. 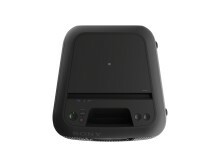 [iii] They’re also so simple to use; with NFC one-touch Bluetooth® connection you just touch your smartphone or music device to the speaker and instantly start listening to your party tracks. 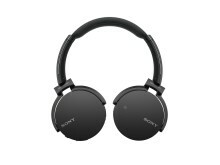 MDR-XB650BT is a Bluetooth® compatible, compact addition to the existing EXTRA BASS series of Sony headphones. With a 30mm driver exclusive to this range, together with an incorporated bass booster structure and dedicated EXTRA BASS diaphragm, the headphones achieve highly realistic notes that precisely carve out the rhythm and groove feeling of the bass. 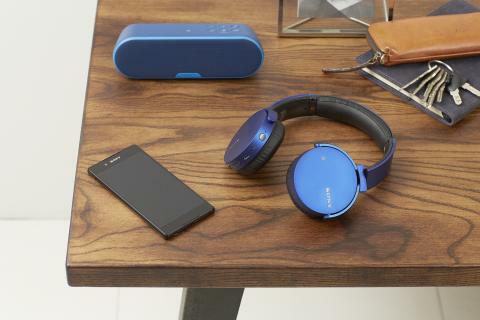 Keeping you wire free, One-touch Bluetooth® connection and music playback is offered via NFC. Compatible with AAC and aptX®Bluetooth® codecs, it enables a premium audio quality sound even when listening wirelessly. 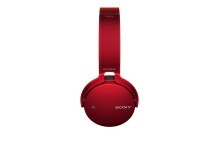 The headphones have been designed specifically to enhance the playback for deep bass. Fitting with an increased contact surface area it achieves a stable fit that can withstand the punchy and deep bass notes. 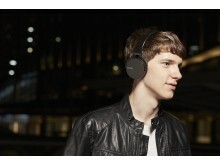 The ear pads have a soft texture and fit close to the skin, achieving excellent wearability with well-balanced sound. The swivel structure design enables the housing section to be folded flat, making them easy to store and convenient to carry wherever you go. To keep you going with your party tunes, just four hours of charging gives approximately 30 hours of continuous music playback. 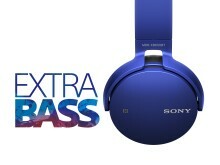 The new EXTRA BASS line-up from Sony will be available in Europe in April 2016 priced at approximately €350 (GTK-XB7), €170 (SRS-XB3), €120 (SRS-XB2) and €130 (MDR-XB650BT). Detailed specifications can be seen here: GTK-XB7, SRS-XB3, SRS-XB2,MDR-XB650BT. [ii]Speaker add function can only pair with the same products.